The Shallow Man is metrosexual and proud of it. I own enough male grooming products to start my own boutique and spend a lot of time coordinating my clothes to match properly. Therefore you can imagine my dismay one fateful day when following an appointment at my dentist when I was told that wearing braces would be necessary. 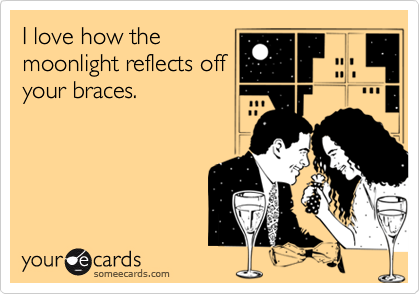 My initial reaction was to see if there was any way of avoiding having to wear braces. Yes my teeth weren’t perfect (I’m from the UK) but surely there was some other solution to having them put behind bars. The orthodontist made it clear to me that my teeth had moved, and that without braces this could eventually lead to severe problems including potential loss of teeth. I wanted to have braces as much as Pegida want refugees in the Netherlands. I was provided with several options for braces and a quote for each. Once I’d made a decision and discussed with my insurance company how much they’d contribute to the costs, an appointment was made with the orthodontist to start the process. My worst fears were that I’d end up looking like James Bond’s former nemesis, Jaws. The fateful day arrived. As I sat in reception at my dentists I shook like some of the ladies one sees jogging along the Amstel, blissfully unaware of the invention of the sports bra. Finally, the time had arrived, and as I sat in the chair I couldn’t help but wish that I could simply have an injection and be woken up when it was all over. The orthodontist did her best to put me at ease. A tip for orthodontists, try giving Vodka (or Champagne) to nervous patients. She then explained what exactly would be occurring during the appointment. Orthodontists are like car mechanics, in the sense that they will throw around technical terms and expect you to understand. They did their best, but talk of brackets, wires and elastics didn’t really make much sense to me. Following the explanation, work began in earnest. The work itself was remarkably painless. The most unpleasant thing about having braces fitted was the sound of drilling and the experience of having what seemed like a small army of people poking around in my mouth. Once it was all over, someone was kind enough to give me a hand mirror so that I could see the results of the clattering and banging that had been going on, I was now an adult with braces. Eventually, your teeth will be straight and will look so much better. Food sticks to braces like a gold digger to an Eredivisie footballer. My pockets were like the dental section of a drugstore, full of sticks, brushes, and floss. Learn to smile without showing any teeth. After over 18 months, the braces were finally removed. So the question you might ask is was it worth it? To which I can only answer, absolutely! Prior to wearing braces, my teeth were as crooked as a politician. Now they’re as straight as the backs of the soldiers standing rigidly on guard outside Buckingham Palace. It was well worth the hours of my life spent cleaning the bloody things. I’m over the moon with the results. Considering I initially went to the dentist to see about options for teeth whitening, the fact that they recommended orthodontic treatment, and fixed some underlying issues was actually a big plus. If you’re not happy with your smile, it’s well worth getting in touch with them. Now I can smile like a shark that’s seen a lone tourist that swims too far away from the beach. 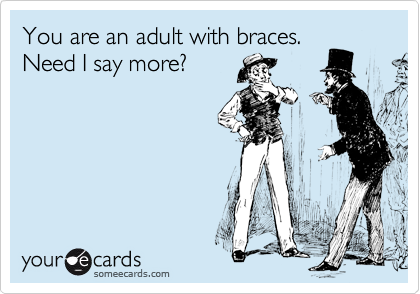 Orthodontic treatment is a pain, but the results are well worth all the hassle.